Computational and Data Scientists construct mathematical models, develop quantitative analysis techniques, and use computers to analyze and solve scientific real-life problems. Our mission is to provide graduates with innovative tools and a collaborative approach to meeting tomorrow’s challenges. Chapman University offers both M.S. and Ph.D. programs in Computational and Data Sciences. The programs follow a uniquely interdisciplinary approach to solving critically important problems, using mathematics, physics, chemistry, biology, statistics and computing. Through modeling, simulation and study of specific phenomena via computer analysis, data mining and software engineering, you will learn to apply extraordinary technology and processes to answer the world’s most complex questions in fields including: Predictive Analytics, Earth Systems Science, Bioinformatics and Biotechnology, Genomics and Drug Design, Population Genetics, and Economic Science. The Ph.D. Program in Computational and Data Sciences offers an interdisciplinary and personalized course of study that emphasizes innovative research and applications of research. 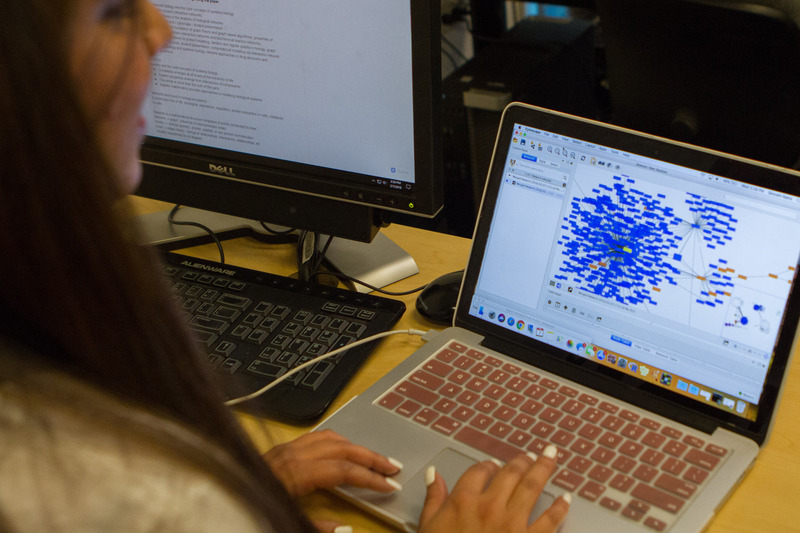 After completing a set of core courses teaching the basic methodologies and techniques of computational science, students will specialize in an area based on shared interests with one or more faculty mentors, culminating in a final dissertation of the student’s choice. Since employers continue to seek computer professionals who can combine strong technical skills with good interpersonal and business skills, the Ph.D. in Computational and Data Sciences prepares students for employment in academia, scientific research laboratories, private industry and governmental agencies. In addition to organizations under the Departments of Interior such as BLM and USGS, the Doctorate in Computational and Data Sciences offers employment opportunities with NGOs and non-profit organizations, as well as manufacturing and private sector companies. The program is offered at the Chapman campus located in Orange, California. Foundation Courses (3-9 credits) – For admitted students who have verified potential, but require supplementary support for success in the CADS program. These credits do not count toward the degree total. Elective and Research Courses (45 credits) Courses selected from the graduate courses in computer science, computational sciences, mathematics, physics and economic sciences. Courses and descriptions can be found in the Course Catalog. A minimum of 15 credits must be at the 700 level (excluding the dissertation courses). · Pass qualifying examinations on topics from the core courses. · Pass a preliminary oral examination on topics from elective and research courses selected by the student’s Doctoral Committee. Any of these courses can be completed at other accredited institutions such as your local community college and other four-year colleges and universities. If you have not completed some of your prerequisite course(s) prior to applying, it is possible to enroll in these courses at Chapman University. However, for your application to be considered for review, you are required to have successfully completed at least one of the prerequisite areas. All other prerequisites must be met by the end of the first academic year. Please contact us for more information. Statement of Intent - a 750 word essay; applicants are expected to address science topics they are interested in and how they envision applying computational science in those areas. Language Test (International Students Only); applicants who have completed their undergraduate degree outside of the United States are required to achieve the following minimum score on Test of English as a Foreign Language (TOEFL): 600 (paper-based), or 100 (internet-based), International English Language Testing System (IELTS): 7.0, Pearson Test of English (PTE): 68 or Cambridge English Advanced Exam (CAE): 180 minimum. See the Academic Calendar for semester start and other dates. 2018/2019 Tuition Information - ALL COSTS LISTED IN THIS SECTION ARE SUBJECT TO CHANGE WITHOUT NOTICE. Financial assistance is available in the form of federal loans, department scholarships, teaching assistantships, and research assistantships. Our industry partners provide scholarship funding as well as internship opportunities for our students. More information can be found on the Financial Aid website or by contacting Graduate Financial Aid at gradfinaid@chapman.edu or (714) 628-2730. Contacts - You are always welcome to contact the Graduate Program Coordinator, Robin Pendergraft, pendergr@chapman.edu / (714) 997-6993 and the Program Director, Dr. El-Askary, elaskary@chapman.edu / (714) 289-2053. Admission – Please contact our admissions coordinator, Sharnique Dow, at sdow@chapman.edu / (714) 997-6770 regarding your application, to schedule a campus visit or for other non-program specific questions. International Students – View our international student admissions page for additional information regarding applying to Chapman. Tuition - Contact Student Business Services at (714) 997-6617 for information regarding tuition, fees, billing & payments. Please note that program staff are prohibited from discussing financial information. Federal Financial Aid - For more information, email gradfinaid@chapman.edu or call (714) 628-2730. The FAFSA must be filed by March 2nd. Must be enrolled at least half time, taking at least 4.5 credits, to qualify for federal loans. If students are interested in receiving loans, they must complete the appropriate applications. Housing - For graduate student housing options, contact Housing and Residence Life at (714) 997-6603. Chapman University's health insurance plan is through United Healthcare. Students may visit the plan website at www.uhcsr.com/chapman to view full plan description, terms of coverage, and more. To search for a particular faculty member, visit our searchable faculty directory. A: CADS is our shortened version of Computational and Data Sciences. Q: Do you accept students that have degrees outside of Math and Computer Science? A: Absolutely. While typical undergraduate preparation for this program will include degrees in computer science, mathematics, and statistics, applicants from other sciences, engineering or business will be considered if they demonstrate sufficient math and computer science preparation. Q: What is required for admission to the program? A: Please review our admissions requirements for more information. You may also contact our graduate admissions team at (714) 997-6711, or gradadmit@chapman.edu. A: The priority deadline for fall admission is January 15. The regular admission deadline is March 1. Q: What prerequisite courses or skills are required for the program? 1. A year or more of programming preferably in Python, C++, or Java; or equivalent or better of professional experience. 2. Completion of upper division differential equations courses such as MATH 350. 3. Completion of upper division statistics and probability courses such as MATH 350 and MATH 360. Q: What if I don’t have all the required prerequisites? Q: What are the minimum scores for the GRE? Q: Do you accept GMAT in lieu of the GRE? A: Only in special circumstances. Please ask if this applies to you. Q: Am I required to take the TOEFL (or equivalent)? A: Applicants who have completed their bachelor’s degree or higher at an institution where English was not the primary language of instruction must submit scores for an English Proficiency exam. Chapman University's institution code for the TOEFL is 4047. Q: Who should my letters of recommendation come from? May I submit additional letters? A: Letters of recommendation should come from former faculty members or those you've worked with in industry who can attest to your academic and professional abilities. Two letters is recommended, but you can submit more if you wish. Q: What are the most important factors in the application evaluation? A: The Program Director and Admissions Committee individually evaluate the entire application for each applicant. Every applicant is different and what might be a strength on one application may not be as highly considered in another. With that in mind, each piece of the application should be considered important. Q: Can I send in transcripts to show coursework from non-degree granting institutions? A: Yes, all courses you have completed will be taken into account by the admission committee. Q: Can I submit my application before I have all the necessary documents? A: Yes, although some sections are required before submitting. Admissions will hold your application and notify us as your documents become available. You will not receive an admissions decision until all documents have been received. A: Priority Applicants will be notified of admission and support decisions in late Jan./early Feb. Regular deadline applicants will be notified approximately two weeks after the deadline. A: The Ph.D. program accepts an average of 5 applicants each fall. Q: Do you accept admissions on a rolling basis? A: No, students are admitted once a year – for the following fall semester. A: The 18/19 cost of the PhD program is $109,550 ($1,565 per credit regardless of residency). However most students receive funding and TA opportunities. Q: How long does the program take to complete? A: Normative completion to the doctoral degree is 4-6 years, depending on the student’s level of preparation, research topic, and rate of publication. Q: Am I allowed to attend part-time? A: Yes, although part-time Ph.D. students are expected to provide their own funding. Q: Is this program online? A: No, this program is not online and does not offer any hybrid courses. A: Most courses are offered in the afternoons and evenings. Q: Can I transfer courses? A: Up to 18 credits may be accepted as transfer credit. We accept both standard and online courses that meet all transfer requirements and are from regionally accredited schools. Q: Is there financial support available? A: Yes, highly qualified PhD applicants will be offered financial packages upon admission. Q: Do I find out about available assistantships? A: Students who would like to be considered for assistanceships should send their CV and evaluations from any previous teaching assignments to the Program Coordinator prior to the application deadline. Please specify level of knowledge in each of the following undergraduate areas: math, physics, statistics, and/or computer science. A: Students are encouraged to apply for external scholarships sponsored by government agencies, corporations, and foundations. Some scholarship search options are found on the Financial Aid - Outside Scholarships page. Q: What are the housing options? A: On-campus housing is extremely limited and graduate students are encouraged to research alternative living arrangements off-campus by visiting our Introduction to Off-Campus Living page. After being accepted to the program, you can connect to the community through Facebook Off Campus Housing and Roommate Corner and Off-Campus Housing Listings. International students should also check with International Student & Scholar Services. Q: How accessible are the professors at Chapman? A: With a small student to professor ratio, CADS students have incredible access in this highly personalized program. Q: Are Chapman's Computational and Data Sciences degrees STEM (Science, Technology, Engineering, Mathematics) programs? A: Yes, students in our program are eligible to apply for STEM benefits. See the International Student & Scholar Services for more information. You can also contact Susan Sams, Specialist International Student & Scholar Services, at sams@chapman.edu or 714-997-6829, with any questions. A: Optional Practical Training or OPT allows you to work for one year, following graduation, in a job related to your major or field of study. See the International Student & Scholar Services for more information. You can also contact Susan Sams, Specialist International Student & Scholar Services, at sams@chapman.edu or (714) 997-6829, with any questions. A: Curricular Practical Training or CPT allows you to participate in an off-campus paid internship that is related to your major or field of study. See the International Student & Scholar Services for more information. You can also contact Susan Sams, Specialist International Student & Scholar Services, at sams@chapman.edu or (714) 997-6829, with any questions. Learn about about our brand new facility, built to support a new era of faculty and students collaborating across programs and disciplines – to solve global challenges.